If you are reading this, you are likely wondering: Is Santorini safe? or is Greece safe? In a short answer, yes, Santorini is a safe place to visit as a tourist and so is Greece as a whole. Santorini has a low crime rate and is full of hospitable people who are hoping to make your visit as memorable as possible. However there are a few things to keep in mind when you visit Santorini, and I have outlined them below. Santorini is a dream destination for many, a bucketlistworthy destination to see! But fears about unrest all over the world have had would-be travellers looking for first hand information from people who are actually on the ground. I visited with my children in the height of tourist season with busy street, beautiful weather and unforgettable views. 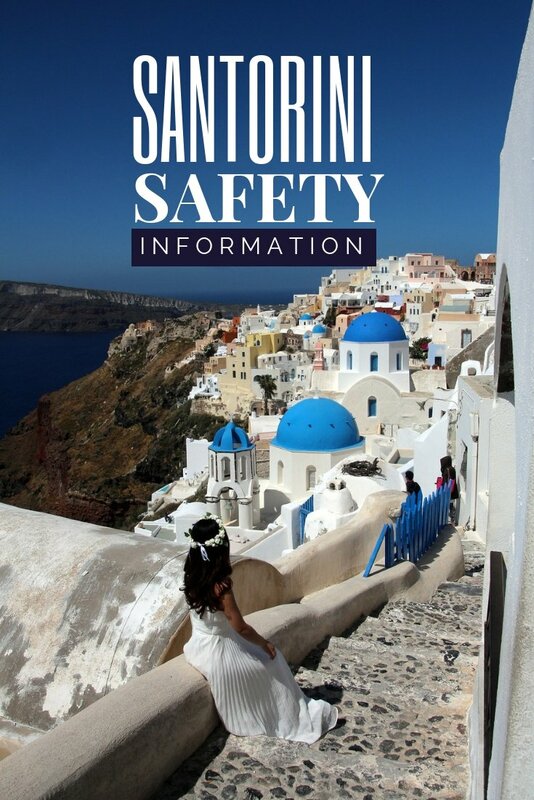 Have a read below about what you do need to worry about when you visit Santorini! One of the biggest dangers in Santorini is traffic. In peak season, the winding roads are packed with busses, vehicles and ATV’s trying to get around the island. There are little to no sidewalks throughout most of the streets so you add tourists hauling suitcases uphill, to the commotion. When you have a bunch of tourists who do not always know where they are going and traffic congestion, there is a chance of an accident. My biggest Santorini safety tip is to keep your eye on traffic and if you are not comfortable driving winding roads and bust streets, do not rent a car. We rented an ATV and had a great time checking off items on our 2 day Santorini itinerary, but I am comfortable driving all over the world. If you are not, take the local transportation to get around the island. Scooters also pose a danger for tourists, as the roads are windy and there are other careless drivers on the road who are in a hurry. If you are not comfortable with a scooter, Santorini is not the best place to learn to ride! I had my two boys with me and we had a 1 km walk (uphill) from the main Fira bus station to our hotel (with two suitcases). Trying to navigate the busy bit of sidewalk the had, and the narrow streets and the bustle of cars was quite chaotic. My kids have decent road sense, but if you are traveling with little ones, always keep them close to you on the streets in Santorini! There is always trucks and busses and big vehicles backing up and turning around and kids are much harder to see! 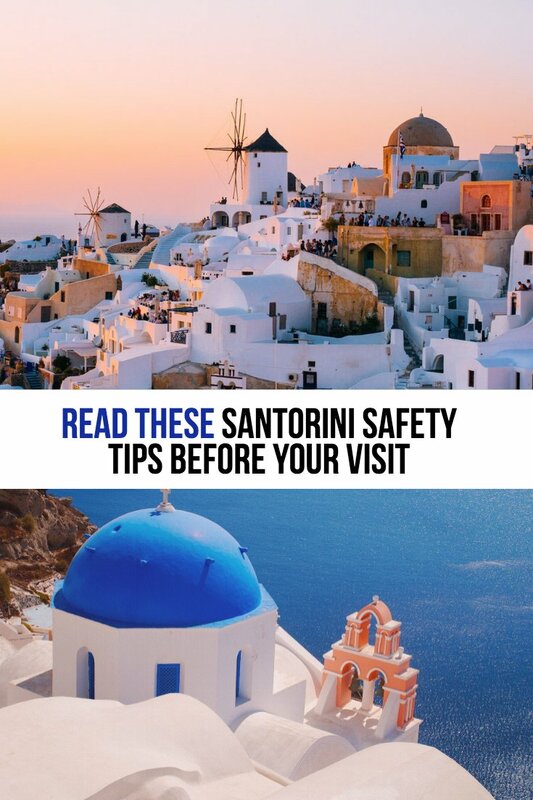 As I mentioned at the beginning, overall Santorini is safe to visit as a solo female but you should take the same precautions you would anywhere in the world. While you may be mingling with the locals at night, you are also likely to be with hoards of other tourists. Keep your best judgement and common sense and you will likely encounter no troubles. Walking home in the dark is also safe. Motorists are the biggest threat but overall crime is low in Santorini, especially violent crimes against women. Fears from past years of ATMs not having money are completely unfounded, and you will not have trouble pulling money out of an ATM in Greece. Credit Cards are also widely accepted, but have some Euros in hand. Migrant refugees are no threat to the safety of tourists in Greece or anywhere else. They have also dropped significantly in recent years. Santorini is also one of the most expensive places in Greece so it is not a hotspot for refugees. SUNSHINE – Santorini is HOT and SUNNY! Pack a hat and sunglasses, sunscreen and drink plenty of water. Especially if you are on a scooter or boat, you do not realize how hot that sun is! DRINKING WATER – While most of Greece serves tap water, in Santorini they seem to serve bottled water and at our hotel we were told not to drink the tap water. We did it all over the rest of Greece, I did not ask questions, but wonder if they are just used to tourists wanting bottled water or if the water in Santorini should not be drunk from the tap. Use your own best judgement here. STRAY ANIMALS – Santorini does not have nearly as many stray animals as other parts of Greece. But again, use your best judgement here, If my kids do come near a friendly cat, I am always careful to wash their hands after. Better safe than sorry. A cat scratch or dog bite can really ruin a vacation if it happens to get infected. Be wary around donkeys if you are not familiar with horses. While the Santorini Donkeys see people all day long, I never touch one from behind and always make it aware that I am near. Regardless of the country you are visiting, check for travel warnings from not only your own country but the United States, UK and Canada government websites. I find by reading what various governments think about a specific country is better than just reading one government’s opinion! You can also read this interview of an Expat in Greece!